Besides converting MTS files, the Mac HD Video Converter can handle MXF/MOV/AVI camera shootings as well as TiVo files. iMedia Converter for Mac is good at converting Blu-ray/DVDs and non-protected video files to your required file types. 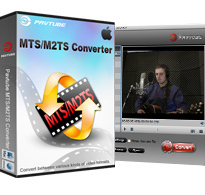 Pavtube MTS/M2TS Converter for Mac, which also considered as a Mac Sony AVCHD MTS Converter, a Canon Vixia MTS Converter for Mac, a Panasonic AVCHD Converter for Mac , is specially developed for AVCHD camera/camcorder users to tanscode AVCHD MTS/MTS footage to iMovie, Final Cut Express, Final Cut Pro, Adobe Premiere Pro and more similar video editing software compatible file types with least quality loss. The Mac MTS converter supports output files for a wide variety of media devices, including iPad/iPad 2/iPad 3, iPod Touch 4, Droid X, HTC Epic 4G, Samsung Galaxy S, Samsung i9000, Samsung Galaxy S III, Nexus 7 tablet, Google Nexus 7 Android 4.1 Tablet, PS Vita, PS3, Xbox 360, and more. With this Mac MTS Converter, you can convert MTS/M2TS to QuickTime, MKV, AVI, MP4, MOV, M4V, WMV, TS, F4V, etc. with desired codec, duration, aspect ratio, and file size. Q: Just purchased your MTS converter and it has failed to install on my mac osx 10.5.8, get error message: Install failed. The Installer could not install some files"/ Applications". Contact the software manufacturer for assistance. Q: I just purchased Pavtube (so I have the latest version). I am using it to convert my camera video files into a format that is compatible with Final Cut Pro for video editing. But none of the FCP formats seem to work. The conversion takes place but I only get an audio file and no video. Final Cut Pro (nor any other program) cannot open these files. Converting the video files to other formats i.e. Quicktime HD, works perfectly well, but none of the "Final Cut Pro" presets do. Is there something I'm missing or is there a bug in the program? A: To convert correctly with Final Cut Pro output formats it is required your computer must be installed with FCP, otherwise there will only be audio without video in the generated file. A: Please find more details at Install and register Mac products. Can I change the output file name? Yes. Please find the column named "Destination File" on file list. Click the particular output name under the "Destination File" column, and then you can specify the output file name. Canon C100 and FCP workflow - how can I edit Canon C100 AVCHD with FCP (X)? Can FCP X import 50p/60p AVCHD files from Sony CX730/CX740/CX760? - Fixed wrong size issue when exporting Apple ProRes video in 1080p. - Fixed BDMV import failure that occurs with OS X 10.8. Users now can import AVCHD folder to the software by drag and drop operation. - Added support for TOD and MOD camera files. - Now preserve Timecode when encoding MXF for Final Cut Pro editing. - Now preserve multi-audio streams when converting MXF to MKV/MP4 and Apple ProRes encoded MOV.